Rabbit's breeding season runs from as early as January, through September. Our rabbits have been feeling amorous since early February. It’s the lengthening daylight hours that signal to the rabbits that soon the earth will be covered in fresh green grasses and new buds on bushes - great nourishment for a doe and her litter (in the wild). Your does might be feeling their hormones! They want to breed. Their hormones might be driving them nuts. If you reach into their cage and they lift their hind-ends...if they seem a big growly, or even take a nip at you...they’re wishing you were a handsome buck. Just because it's breeding season doesn't mean you must breed your animals. Be especially understanding with the moods of your does. Chances are they'll calm down. In the meantime, approach the doe with an elevated hand, and then "swoop in" on her back or neck quickly. The height of your hand simulates a hawk swooping down. She may choose to crouch and freeze, rather than try to get testy with you. Once you have your hand behind her, it is much easier to secure her and possibly pet, comfort or move her. Chances are, you'll at least get your rabbit chores done safely if you know this trick. Be extra careful that bucks and does can’t escape and rendezvous. If you raise rabbits for meat or show, now's the time to breed. Heh heh...I'm guessing your rabbits have already 'told' you. Need a refresher on breeding rabbits? Here's a link to our Breeding Rabbits page. Or, drop us a line on our Contact Us page. CBS aired the following story about a huuuuge rabbit on the Early Show, Feb 19, 2010 - perhaps you saw it? Ralph is a continental giant - colossal indeed! He’s a 42 pound rabbit, 4 feet long all stretched out, and he eats 4 pounds of food a day. Yet he doesn’t appear to be overweight in the picture - what do you think? The woman, Pauline Grant, of Uckfield, England, purchased a little bunny for her grandkids to play with, thinking it would be a typical normal rabbit. What she didn’t realize, and the breeders may have failed to tell her, was that the "bunny" was a British Continental Giant. But other than feeding Ralph enormous amounts of food, it hasn’t been all bad for Pauline. Her granddaughter, Ella McDonnell, says it’s a lot of fun to play with Ralph. 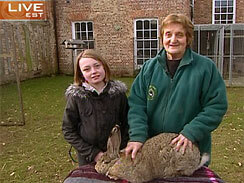 More people are choosing to keep giant rabbits instead of dogs, at least in the UK. Maybe this is because larger rabbit breeds tend to be more gentle and laid-back than small rabbit breeds. Continental Giants and Flemish Giants came from the same original breeding stock. 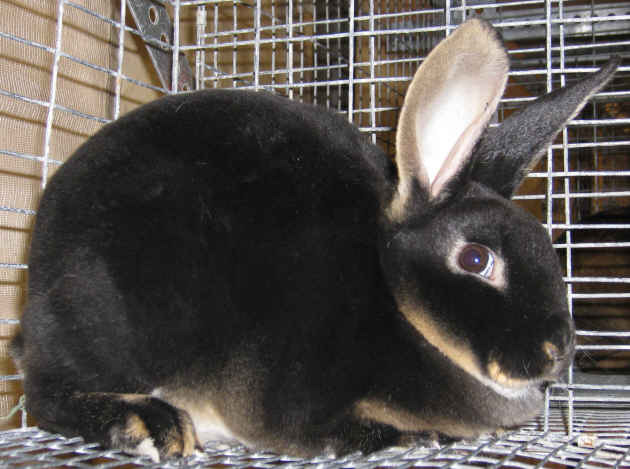 Separate breeding programs by folks in England and the United States, resulted in similar rabbits having slightly different characteristics, due to the way the rabbits were selectively bred. And there are some differences. In England, the BRC grants more points to the biggest rabbits. In the USA, the Flemish Giant standard of perfection simply calls for a weight over 14 pounds (does). Because of these differences, the propensity for large sizes has been built into the genetic makeup of continental giants. Flemish Giants still grow plenty big, but more Continental giants become truly...gigantic. Ask plenty of questions of the breeder, until you’re satisfied that you understand what you’re getting into with a particular rabbit purchase. Can you afford 4 pounds of food a day just for the one rabbit...? ALL the teeth in a rabbit's mouth - all 28 of them - continually grow, not just the front four that you can readily see. Without sufficient fiber to wear down the rabbit's teeth, some big problems can result. Tooth roots can grow too deeply into the jawbones, causing pain and difficulty chewing food. With teeth problems, the rabbit loses weight, may start slobbering, and may develop jaw abscesses which weaken the immune system. Uncared for, the rabbit can die from the abscess, or from an unrelated illness due to a general rundown condition. The immune system can only fight infection for so long, and then it runs out of ammunition. Feed fiber every day. Grass hay is great. Find a rabbit-savvy vet before you need one. This is our black otter doe, "Damask," at approximately 3 1/2 months old. She has since become a grand champion. We’re quite pleased with her! Send us pics of your bunny, your backyard rabbitry, your best show rabbit, or even your worst. Tell us the story of your picture in a few words - we’ll pick the fave and publish it in next month’s Rabbit Rhythm. Psst - Coming soon to www.raising-rabbits.com - Write your own pages and make comments on most everything! Projected go-live date is March 12, 2010, or before. Come visit soon, and join in the rhythm! Enhancements to our indoor rabbit cage page(s)! We built a very large PVC frame for an all-wire cage that is big enough for a flemish giant. (Not sure if 42-pound Ralph would fit...) We spray-painted it blue, set it up in our dining room, and then showed you exactly how we did it. Check it out! https://www.raising-rabbits.com/indoor-rabbit-cage.html. We’re planning to feature a rabbit-supply company and a product that makes rabbit-raising easier for you. Like this newsletter? Share it with your friends!